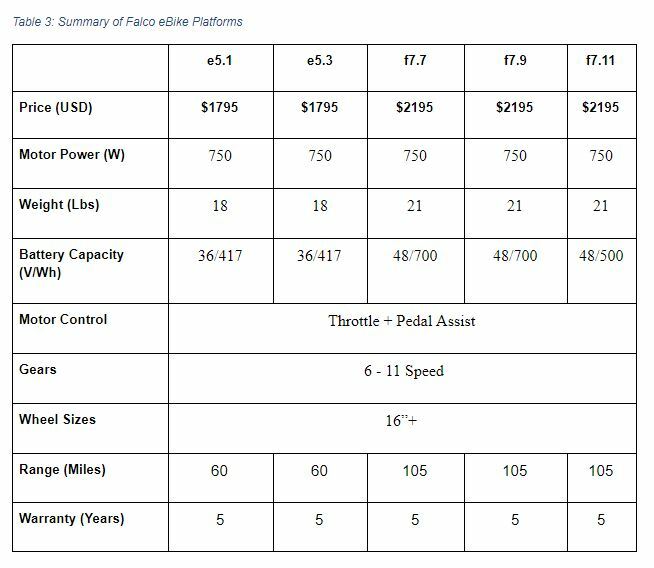 Falco e5 series is 114% more powerful, with 32% more range and with more than 2x the warranty of BionX systems (and it is considerably cheaper)..
Abstract: This article presents a side by side comparison between Falco eBike conversion systems and BionX kits. Both companies offer direct drive motor platforms for eBikes and eTrikes. The paper considers published specifications and website information. Parameters such as cost, motor power, torque, weight, installation, warranty, etc. are compared between the two companies. Introduction: Direct drive (motor in the wheel) platforms for eBikes have been gaining in popularity over the past couple of years. Mid-drive platforms (motor in the crankset) gained popularity after Bosch's launch of such platforms in 2011. However, mid-drive platforms have struggled on many fronts, and almost all components of an eBike have required significant re-engineering. Direct drive motors have not needed any such restructuring keeping the eBike costs much more affordable than the unsightly and unnecessarily expensive mid-drives. However, Direct drive motors have not been without disadvantage. The overheating and extra wheel weight have been two most prominent complaints. Direct drive manufacturers such as Falco, BionX, Go Swiss etc. have worked hard to address these issues with great success. With the ever-increasing complexity of mid-drive motors and high maintenance costs, direct drive platforms have seen a tremendous resurgence recently. BionX launched its original eBike systems in 1998 . The original inventor of the system Jean-Yves Dube filed the first patent application in 1999. BionX enjoyed significant success after their use by Matra in 2005 and then by Trek in 2009 followed by some major European manufacturers. However, the earlier motors were underpowered and suffered from some severe quality issues . With Bosch’s introduction, BionX was virtually knocked off of the European continent because they were local and provided good customer support. BionX had to re-invent itself to survive. With the introduction of their D-series and Elby in recent years, things have begun to look up for BionX. Falco launched its eBike systems in 2013 and its inventor Rakesh Dhawan filed its first patent in 2013 as well . The Falco hub inventor had previous history in the electric bike industry with his work at Wavecrest Laboratories LLC (Tidalforce Electric Bike), Matra (Introduction of Tidalforce in Europe), Accell group (redesign of ION propulsion system) and Electric Motion Systems LLC (E+ electric bike). Falco’s inventor was well aware of issues in the eBike systems. The following advantages: high power and torque density, high efficiency, simplicity (all intelligence and smarts must be in the motor and not in the battery or console), near-zero resistance pedaling and total independence from a closed battery system (aka an open system) helped to establish the parameters behind the Falco drive systems. The Falco hub has gone through many revisions in recent years to meet the highest standards of performance and reliability. Exacting quality standards with industry-leading 5-year warranty (higher than BionX, Bosch or any other eBike propulsion supplier in the market) define the Falco hubs. 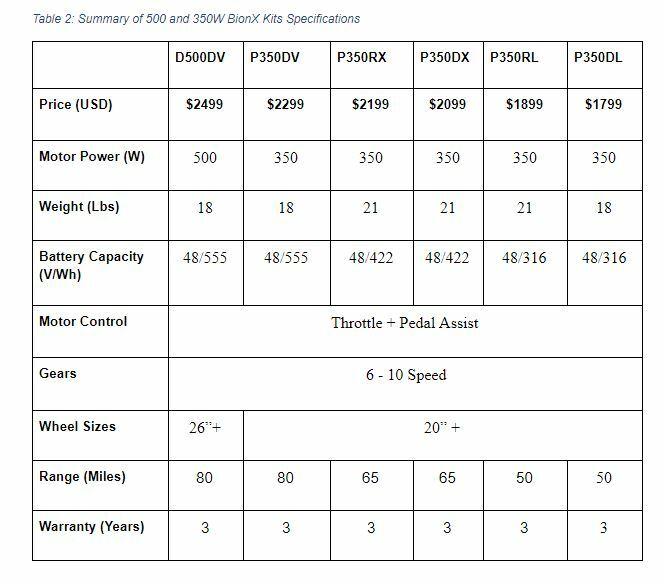 BionX eBike Platforms: BionX has two categories : 500W and 350W. 500W kits use their D-series motor, and the 350W system uses their smaller diameter motor. BionX 500W Platforms: D 500 DV, the 500W system uses their D series motor and a 48V/555 Wh Lithium battery. Falco eBike Platforms: Falco currently carries five platforms . All platforms use Falco's 750W motor. Battery capacities range from 400Wh to 700Wh. P Series BionX Kit Comparison with Falco e5 Series: Table below summarizes the comparison between the two companies. Discussion on BionX P-Series vs. Falco e5 Series: In the table above, we have highlighted in green the various advantages for each of the companies. Motor Power and Torque: BionX claims the power of 350W vs. Falco's claim of 750W. BionX claims a torque of 40Nm vs. Falco's claim of 45Nm. BionX uses a 3-phase technology vs. Falco's 5-phase technology. Falco produces 114% more power and 12.5% more torque than BionX. Free-Wheeling Resistance: Falco uses a 5-phase hub which has a substantially lower free-wheeling resistance than any existing 3-phase motor including BionX. Price: BionX’s P-series is $4 to $504 more expensive than Falco’s e5 series. Battery Capacity and Range: Falco’s e5 series offers 417Wh battery capacity as compared to 316 to 555Wh by BionX. General Philosophy of Operation: BionX, like all other main motor and drive manufacturers, likes to daisy-chain together the battery and the motor to the display, console, etc. The problem with that approach is that a single weak element in the chain disables the entire system. Maintaining a chain is quite complicated. Falco does not believe in complexity or linking the motor to the battery to the console through a complex chain. On an electric bike, there are no advantages of such arrangements. Falco believes in utter simplicity. The Falco hub has the most intelligence. It can interface with any battery and can be operated with one of the Falco HMI (Human Machine Interface) or Falco smartphone apps. Pedal Assist Operation: BionX has a built-in torque sensor allowing for a proportional pedal assist operation. Falco's 2018 hubs have integrated torque and speed sensor allowing the hubs to have a much better and safer pedal assist activity. A simple torque sensor is not able to determine all the user intent accurately. Such purposes require both torque and speed sensors. BionX hubs do not possess a speed sensor as of this writing. Open System: Many riders have lost the value of their investment when the battery dies or is obsolete, and they need a new battery. In case of BionX, the rider must have a BionX replacement battery causing a sort of monopoly for BionX. Consequently, BionX can charge a very high price for the replacement battery. Instances have also happened where the battery is obsolete, and BionX has failed to provide replacement outside the warranty period. Such an arrangement hurts riders. Falco has avoided this scenario by making the batteries not be part of the chain and allowing any other compatible battery to interface with the Falco hubs. This design feature significantly safeguards the consumer’s original investment. Conclusion: In a nutshell, Falco e5 series is 114% more powerful, with 32% more range and with more than 2x the warranty of BionX systems.